FERC’s eTariff rules allow you to associate a tariff record you are submitting with a previously filed tariff record. In TariffShark terms, a Filed Tariff Record Version (FTRV) you are preparing to submit may be associated with an FTRV from an earlier Filing. This article will explain why you might want to associate two FTRVs and how to do this in TariffShark. An FTRV association tells FERC (a) to ignore the earlier-filed FTRV as you are no longer proposing that TRV for consideration and (b) to use the latter-filed one as a replacement proposal. Upon OSEC acceptance of the second FTRV, FERC assigns a status of OBE (overtaken by events) to the first one (if it is still pending before the Commission). The most common scenario where it would be appropriate to associate one FTRV with another is when filing a corrected FTRV (generally done in an amendment-type filing). In this situation, the latter-filed FTRV is clearly a replacement for the earlier-filed one. In TariffShark, associating an FTRV with another one can be done easily from the Update Filed Tariff Record Version screen. Open the Filing Details screen for the Filing you are preparing to submit to FERC. On the Tariff Record Versions tab, select the desired FTRV and click the Update FTRV command in the SmartBar (shown below), which will open the Update Filed Tariff Record Version screen. 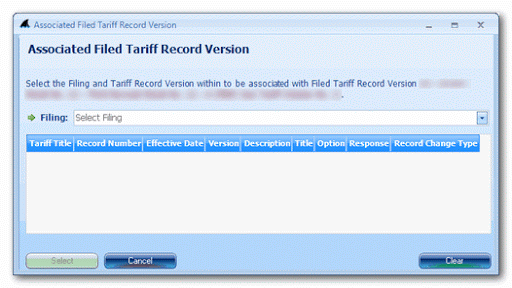 On the Update Filed Tariff Record Version screen, click the ellipsis button next to the Associated With field (shown below) to select an earlier-filed FTRV to which an association should be made. In the resulting pop-up form (shown below), (a) select the earlier Filing, (b) then select the earlier-filed FTRV in the grid, and (c) then click the Select button. Back on the Update Filed Tariff Record Version screen, click the Update button. Seems easy enough, right? Well, the vanilla case described above is pretty straightforward. However, there are more complex scenarios where it may or may not be appropriate to make an FTRV level association. TariffShark does not pretend to understand all of the regulatory nuances surrounding the filing of tariff records. Instead, it issues validation warnings in order to make you aware of opportunities to associate FTRVs and allows you to decide if it’s appropriate or not. There are several validations in TariffShark that relate to FTRV level associations and most of these are very specific. However, detailed below are the general purpose warnings. Note that FTRV FERC Response (which describes the status of an FTRV) plays a big part in these validations. Therefore, it is very important that you keep your FTRV FERC Response values accurately updated. Filed Tariff Record Version (FTRV) “” is associated with another FTRV whose FERC Response is “Pending”. If the associated record has a status of “Pending” at FERC, submitting this Filing will cause the associated record’s status in the eTariff Viewer to become OBE (overtaken by events). Proceed with caution as this may not be what you intend. If you have associated an FTRV with a Pending FTRV, this message appears. In the vanilla case where you are submitting an amended FTRV, you would expect to see this validation warning. Filed Tariff Record Version (FTRV) “” is not associated with another FTRV, yet one or more “Pending” FTRVs exist. If you intend to submit this FTRV as a replacement for one of the pending FTRVs, then you must associate this FTRV with the one you wish to replace. If you have not associated an FTRV with another FTRV and one or more Pending FTRVs are present, this message appears. Filed Tariff Record Version (FTRV) “” is associated with another FTRV. Tariff Record “” has child Tariff Records. Submitting this Filing will cause the associated record to become moot and its status in the eTariff Viewer to become OBE (overtaken by events). This automatic update in FERC’s software cascades to child Tariff Records also pending at FERC from earlier Filings. Under certain circumstances, this causes the child records to disappear…as if they hadn’t been filed. Proceed with caution! The disappearance of child tariff records in FERC’s system happened to a TariffShark customer in 2010 after submitting a baseline eTariff filing followed shortly thereafter by a subsequent filing. A complex combination of circumstances caused the child tariff records to disappear and such circumstances are not likely to be reproduced. All the same, we felt it was prudent for TariffShark to warn eTariff filers of the potential issue. If you would like to know more about FTRV-level associations or if you have any other questions, please comment below or contact TariffShark Support.